Initially, my motive to climb Mt. Ugo was to do an outreach but I wasn’t able to join my group last year.. Organizing an outreach climb isn’t easy so I decided to first observe the place (Domolpos Village). Perhaps in the future, my climb buddy and I might be able to finally organize one. Hopefully! Our visit to Mt. Ugo was a two-day traverse (overnight weekend climb). The mountain is a popular climbing destination in the Cordillera region along with Mt. Pulag, Mt. Ugo and Mt. Napulauan. 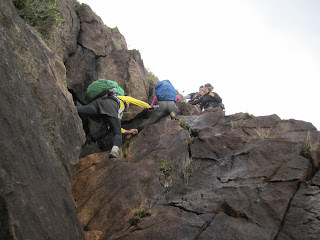 I was happy that this 2012, I was able to complete these great traverses in the Cordilleras (We went hiking Amuyao in June and then Napulauan in August). We were just blessed to have a very fine weather. We’re a total of 18 climbers including my sister Maybelle. This climb was her fourth but her first ever traverse, that’s why doing a long trek really surprised her. The event was simple yet still memorable. Perfect weather, good companions, laughters, wonderful views, food, friendships. Started at 9am and lunch break at Indupit Village. The trail was really ascending until the Indupit Village where after eating lunch and then resumed, we trekked plainly and steadily at plateaus. Such gradual trek lasted only upon approaching summit where succeeding assault trail follows. Along our trekking, I finally saw the school at Domolpos Village. Perhaps, such school of the village is fortunate enough that they are recipients of outdoormen’s generosity and initiative to help. The school as I view from afar looks fine and newly painted. (On the other hand, I knew I could have gone down there and assess further, perhaps the school there needs more). To continue, as we trek up summit of Mt. Ugo, it started to get foggy. We reached the campsite ( a few meters away from summit) at 5:30pm. It also started to get colder. The cold temperature there as compared to the other Cordillera mountains I mentioned above is much more tolerable. Maybe, we were just given a fine weather, no strong winds, no rains. Sunrise viewing the following morning, The only mountain I’ve identified there at the campsite was Mt. Pulag. After eating breakfast, we did respective "breakcamp" and started the traverse.. after a very few steps was already summit. I now understand why it’s better not to camp there although there’s a lot of space. It’s because cows are scattered and possible attack may happen. A very steep descent and then we reached the pine forests. As we trek, a clear view of Mt. Sto. Tomas and Baguio City can be seen on the left. That sunny day was really sunny and really made my skin even darker. The trek at pine forests, although it’s only steady hiking, was still tiring because of somewhat long trek to Itogon (the exit point) under extreme heat of the sun. Most of us were already running on the trail. Nearing exit point, was little assault trails and steep descents. Finally, we reached the long hanging steel bridge marking the end of the trek. We got our certificate and did our wash-ups at the barangay office. It was around 6pm when we left for Baguio City.